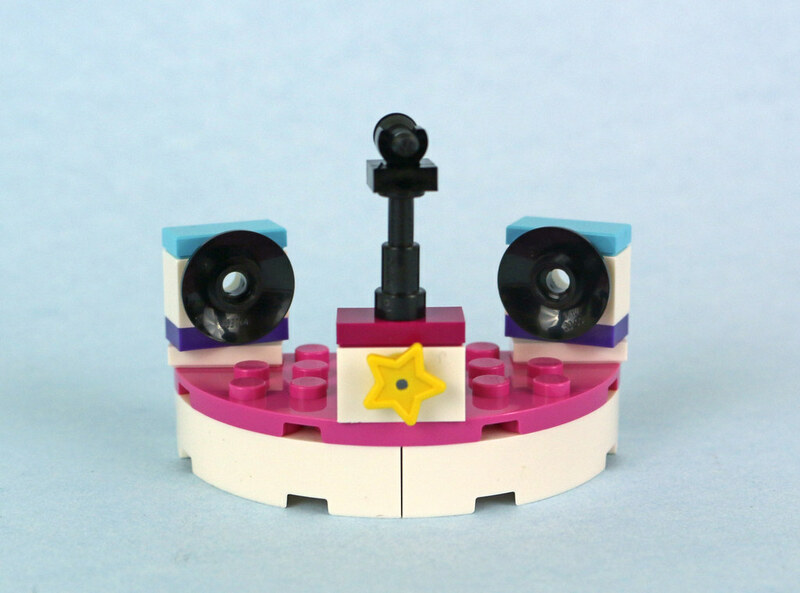 The Captain reviewed 40170 Build My City Accessory Set earlier this month. 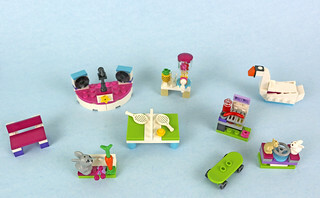 Today we'll take a look at 40264 Build My Heartlake City Accessory Set. Like the City accessory set, there are no minidolls with this set and it consists of a series of smaller builds. The general scene is set in a park, so to me it's a little reminiscent of a smaller version of last year's City Fun in the Park set. Will this be a promising little pack like the City set? The first thing that struck me about this set is the box. I understand the need to make the packaging different for Friends sets with the indented edges of the front of the boxes of regular sets, but this one I don't understand. It's a smaller box that has a slope on one end. The front of the box shows all the small builds in a park setting, and the back of the box (not pictured) merely shows that the builds can be combined with 853671 Heartlake City Playmat. Inside the box are three unnumbered bags, a small instruction booklet and in a delightful surprise, no stickers whatsoever. The first build is something so common I haven't taken a picture of it individually: a skateboard (it's included in the overall picture). 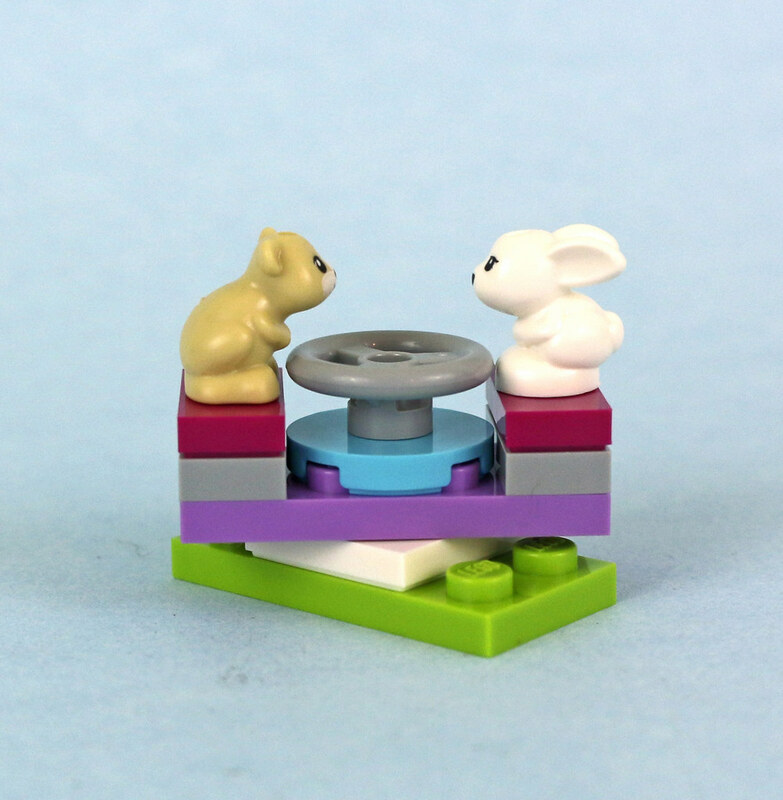 The first build of any substance is an animal roundabout that includes two little animals, a baby bunny and a hamster. The build rotates on a swivel on a green base. Following that is a table tennis set, complete with two racquets, a nice use of a fencing section for a net and a yellow 1x1 round plate as a ball. 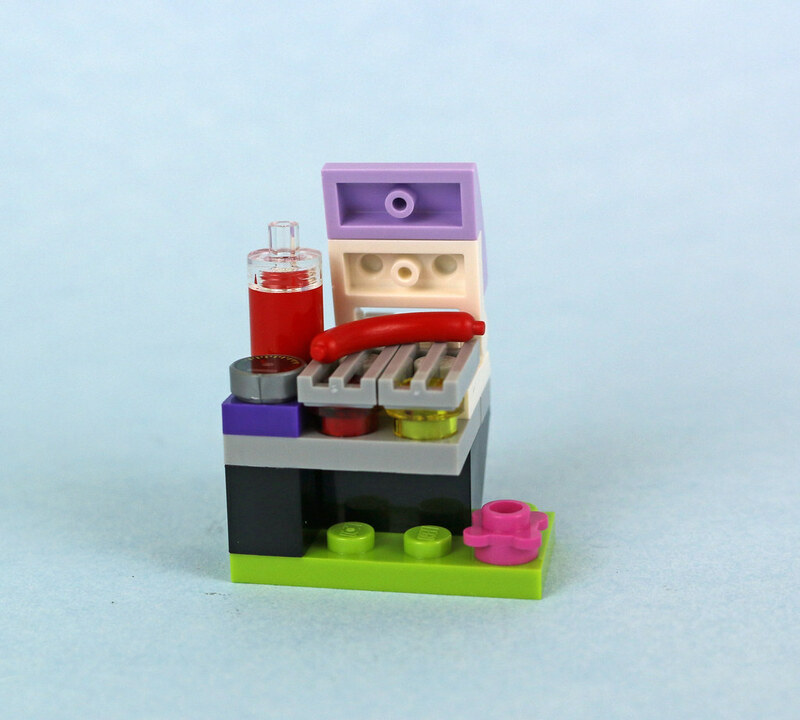 One of the more interesting builds in the set is the barbecue, with two burners, a round control tile on the side and a hinged lid. There's a sausage on the grill for lunch and a ketchup bottle off to the side. The choice of a ketchup bottle is interesting and the idea of putting ketchup on a hot dog would be sacrilege in some areas of the U.S., where nothing other than mustard would be considered. Regrettably, no hot dog bun is included. The next build adds another animal to the mix - another bunny. 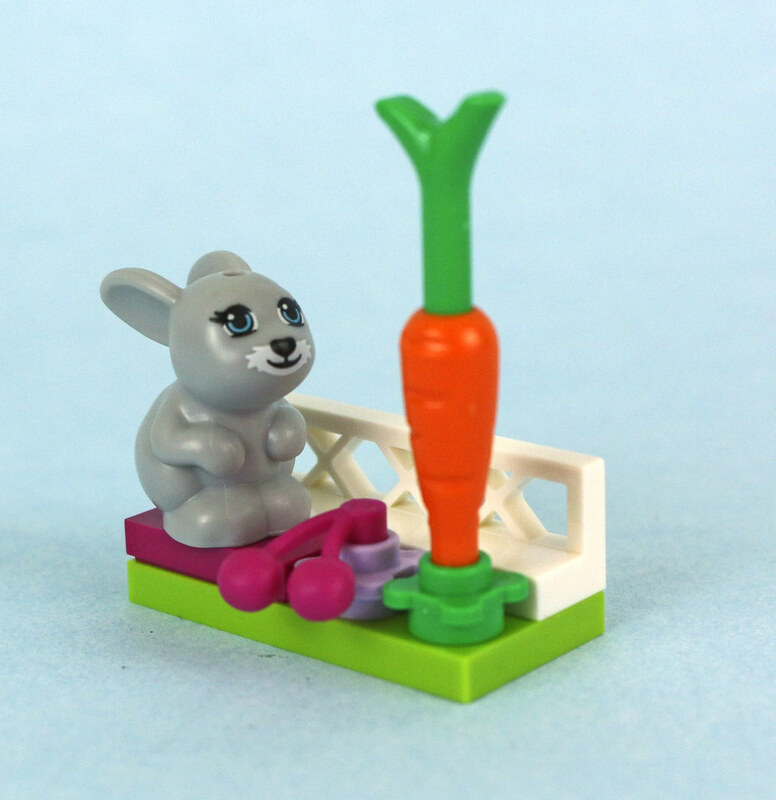 This is a small build showing the bunny on a perch with a fence (or a table tennis net?) behind them. He's about to enjoy a meal of cherries and carrots. 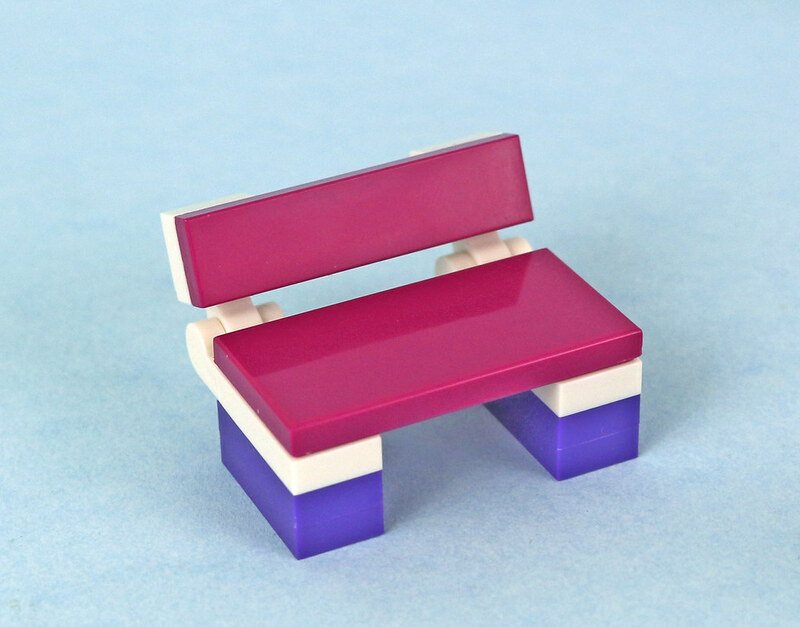 This is followed by a pretty standard park bench, though I do like the use of the magenta and purple. 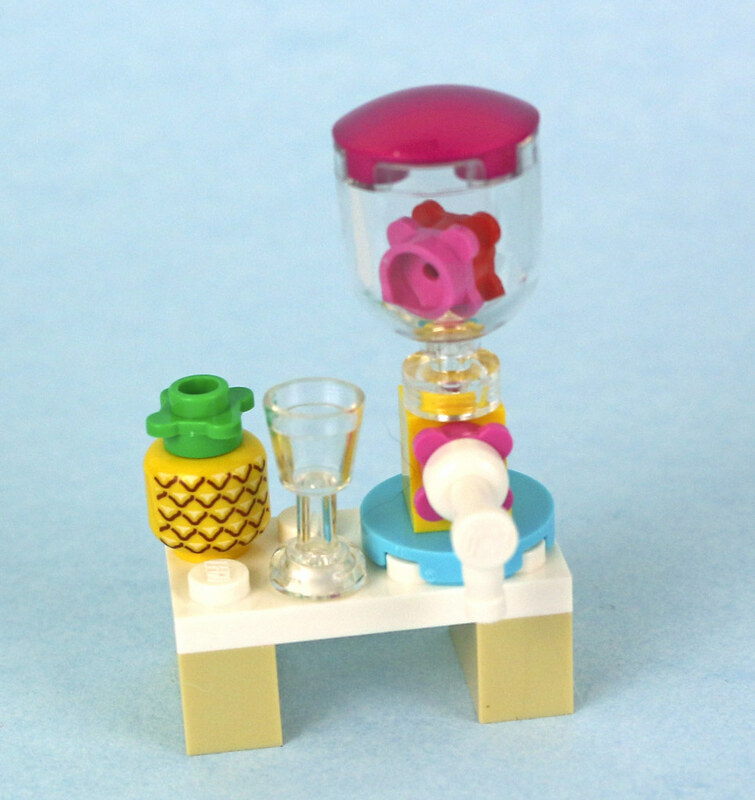 Another interesting build in this set is the juice maker, with a tall blender with fruit inside, a spigot for pouring, a handy glass nearby and a pineapple ready for the next batch of juice. 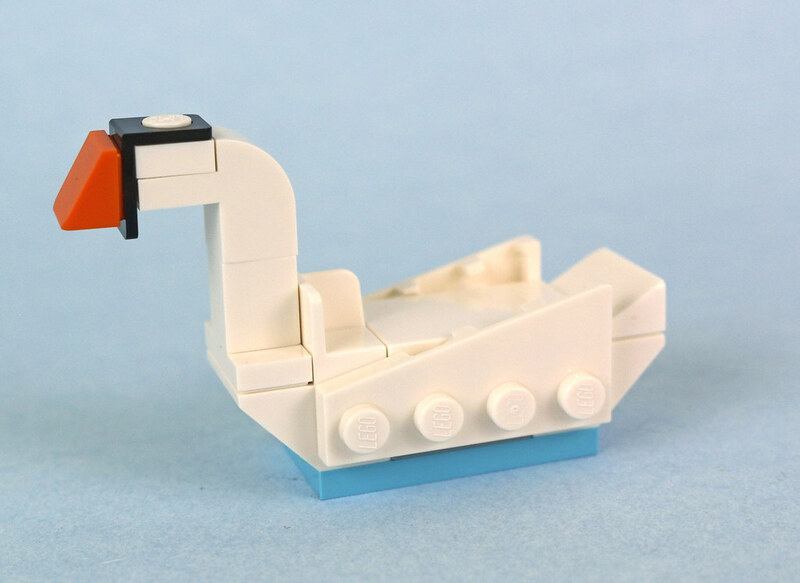 The most inventive build of the set is the large swan, meant for carrying a single occupant across a lake or water feature. In the first build I neglected to add the 2x4 magenta plate, and I think it looks quite nice in just white. I've also included it built the way it's documented in the instructions. The final build is the stage, which seems to be a prerequisite for many Friends sets. This stage is elevated, and comes not only with two speakers but also a microphone stand. I like the inclusion of the microphone stand as too often the mike is loose in the set and there's nowhere to store it. Like the City Accessory pack, this set is very reminiscent of an advent calendar with the series of small builds. In fact, in my opinion this sets highlights just how lacking the Friends Advent Calendars have been. This Accessory pack has just over half the pieces of the 2017 Friends Advent Calendar (121 pieces for the accessory set vs. 217 for the advent calendar) in nine small builds for one third the price ($9.99 for the accessory set vs. $29.99 for the advent calendar). A bonus is that there are three animals included in this set compared to five animals in the advent calendar. Each build does well as a standalone piece and would fit in well anywhere. Like the City Accessory set, there are few rare pieces (the animals have been seen in a few places before) so it would be a disappointment for those looking for this as a parts pack. For the price I think this is a great set to add to any Friends collection. And yet I'm always going to see this set as a giant swan attacking the poor users of Heartlake City's park. Possibly the tennis rackets and microphone stand were included as impromptu weaponry? The skateboard to enable a quick escape? The Christmas set has 175 pieces and three mini-figures, so I think it's clear LEGO will be increasing the price of that set. No stickers?! That's a plus. And the set looks better than a Friends Advent Calendar. 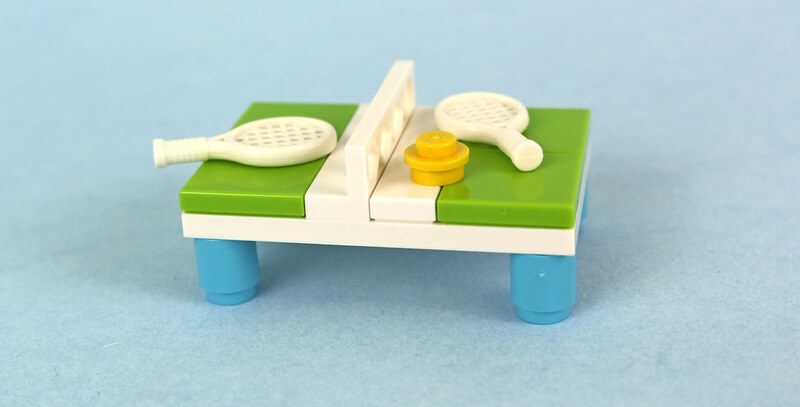 I like the grill and the table tennis set. We bought ours in a Lego brand store in the Washington DC area, where both this one and the city one were shelved with other sets of their theme. I haven't seen them yet in other stores. I like this. 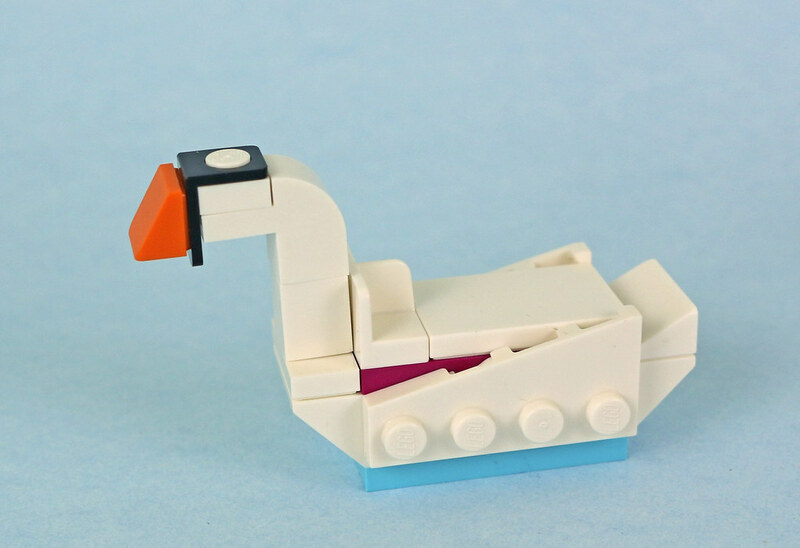 Especially the swan. Infact mostly the swan!! It's kind of silly they have tennis rackets here to play table tennis with. But two tennis rackets in a $10 set? I'm sold. @LuvLegos_Cool_J I don't think the lack of stickers is anything to get excited about if there aren't any printed pieces either. It's easy to have no stickers in every set - just throw them away! The box of the City Accessory set is slanted in the same way. Both sets are readily available at both LEGO stores in my vicinity.